The best lifts (with load capacity ranging from 2,000 to 12,500 kg and more) ever designed. Usually, GPL® goods passenger lifts with high capacities are designed for loading and unloading operations by “forklifts”. The goods passenger lifts are equipped with direct drives and 2 or 4 telescopic pistons with mechanical synchronization type EC or TCS (for narrow shafts). If necessary, pawl devices are used to further stabilize the lift car floor during loading operations with forklifts. The Goods Passenger Lifts GPL® feature the worldwide unique GMV technology, the direct drive 1:1 application, which keeps the car floor the stable during loading operations of several-ton forklifts. The lift shafts are characterized by extremely small dimensions in relation to the size of the lift car. The Goods Passenger Lift GPL® has the greatest coefficient of shaft space utilization (surface area car/surface area shaft), compared to all other standard goods passenger lifts. The shaft walls are of light construction because the masses are charged mainly on the shaft bottom, therefore no strengthening of the walls is needed. Besides their longevity, these solutions, unique in the world, are appreciated for their simplicity and easy installation. The Goods Passenger Lift GPL can work at very high traffic conditions, for example in assembly lines. A very important parameter to consider when choosing a goods passenger lift is the grade of withstanding torsions and forces. In case of load capacity equal to or higher than 2,500 kg, the lift standards recommend to take into account an acting force on the car sill equal to 60 % of the rated load if loaded by pallet trucks, and equal to 85 % of the rated load if loaded by forklifts. The fulfillment of these conditions is not easy. It requires not only the direct drive 1:1 application but also a proper designing of the car frame and car floor sills. In many factories all over the world, inappropriate goods passenger lifts are in service. After the first run, it emerges that only small devices may enter for loading operations, and despite of their large size, cabins are often overloaded. The bad choice of the appropriate lift solution in a factory usually has a return in lower operational efficiency. The range of GMV parameters for goods passenger lifts is wide, therefore we suggest you to benefit from our experience. Goods Passenger Lifts GPL® may be defined as ecological for their low energy consumption, their use of few materials and for their total weight up to 40 – 60 % lower than other electric and hydraulic goods passenger lifts. This also means less power consumption for the manufacture and the transportation of the lift. Another advantage of the Goods Passenger Lifts GPL® is the light construction of the shaft manufactured with few materials, thanks to the fact that forces are all charged on the bottom of the pit. In terms of safety as well, the Goods Passenger Lifts GPL® are unparalleled, since there are no masses such as the counterweight and the engine suspended above the car roof, no traction ropes holding the lift car. The machine room is located in a separate space, which ensures the safe installation and upcoming maintenance operations. 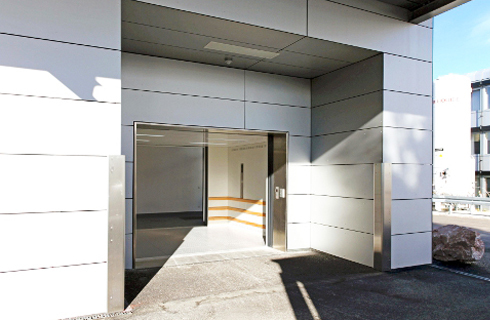 Goods Passenger Lifts GPL® are the perfect solution for multi-story factories and warehouses. GMV solutions integrate vertical and horizontal transport of goods in a highly efficient logistic system. The choice of the appropriate goods lift requires a careful analysis of the scopes and requirements of a future user. Warehouses and factories need forklifts, therefore elevators with large-sized cars should always be designed in order to permit full load forklift operations. There are four different operational modes with goods passenger lifts. GMV Goods Passenger Lifts GPL® work in all four modes. Most of our competitors offer goods passenger lifts working only in the alternate or the simple mode (hydraulic goods lifts 1:1 and 1:2 and electric goods lifts including the MRL versions). Thanks to a technology unique in the world, GMV has been a leader for goods passenger lift solutions since many years. Max. travelling height (m) 13,7 with standard pit (1200 mm) and standard head (3400). * The indicated versions are standard versions. Additional versions with different rated loads (up to 12,500 kg and more) are available upon request. The VL® Vehicle Lift is a special version of a goods passenger lift produced with the GMV hydraulic technology, traditionally used for the transport of persons and goods and now adapted to the transport of vehicles. The VL® Vehicle Lifts feature the worldwide unique GMV technology, the direct drive 1:1 application, allowing to keep the car floor stable while entering with a vehicle. Moreover, the lift shafts are characterized by extremely small dimensions in relation to the car size. 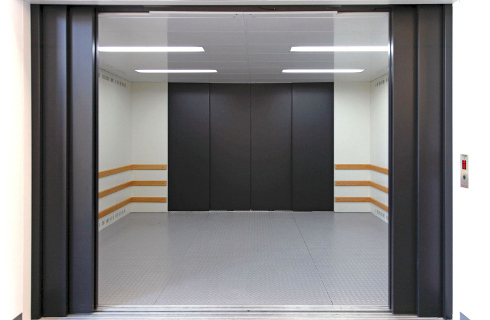 These vehicle lifts are ideal for multi-level parking garages, both underground and above ground. 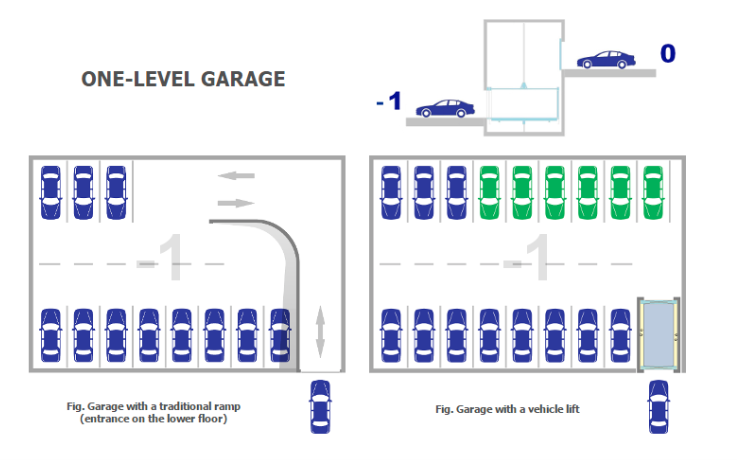 This is often the only way to allow parking structures below buildings in urban centers. Moreover, the costs of a GMV VL® Vehicle Lift with a proper shaft for a 2-level car park represent 30 – 50 % of the costs for constructing a driveway in traditional reinforced concrete. In other words, if you choose a GMV VL, you will have a plus of 12 to 16 parking lots in return. Have a look at the advantages in the following drawings. The advantages in terms of gaining parking lots and a future rental income are evident. GMV provides VL® Vehicle Lifts in the H version (VL30 H, VL35 H, VL40 H, VL45 H and S-VL H) with raised cabin and the door sizes up to 2,6 m for access of vehicles with a roof box. 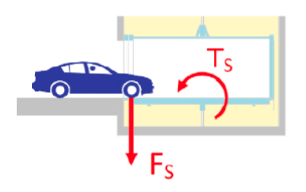 A critical loading situation is given by a car entering the vehicle lift. These conditions have to be taken into account when projecting a vehicle lift. The force (Fs) acts upon the car sill. The car, the car frame and the T-guides should be strong enough to withstand forces and torsions (Ts). The Vehicle Lift VL® may be defined as ecological for its low energy consumption, the use of few materials and for its total weight 30 – 60 % lower than other electric and hydraulic vehicle lifts. This also means less power consumption for manufacturing and transporting the vehicle lift. Another advantage of the VL® Vehicle Lift is the light construction of the shaft by using few materials, thanks to the fact that the forces are all charged on the bottom of the pit. Also in terms of safety, the VL® Vehicle Lifts are unparalleled, because there are no masses such as the counterweight and the engine suspended above the car roof and no traction ropes holding the car. The machine room is located in a separate space, which ensures the safe installation and upcoming maintenance operations. It is possible to call the vehicle lift by remote control. and standard head (3400 mm). 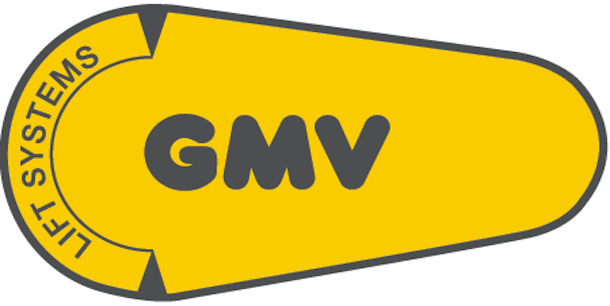 Moreover, GMV provides the extraordinary SUPERVL® (SVL®) with a rated load ranging from 5,000 kg to 10,000 kg, a car size of 3,0 x 6,0 m and a door opening of 2,8 m. SVL® is designed for the transport of armored limousines and special vehicles. 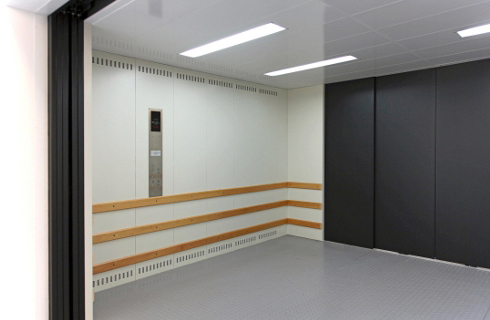 GREEN LIFT® – TML® 1600 HOSPITAL is the ideal lift for hospitals, nursing homes or buildings for social facilities. It is a hydraulic lift for passengers, with a rated load of 1,600 kg, designed to transport both passengers (up to 21 persons) and stretchers. The lift is produced according to the standard ISO 9001 and complying with the requirements of the European Lift Directive 2014/33/UE. The lift car size of 1,4 x 2,4 m and a door opening of 1,2 m allow free transport of stretchers and patients, medical equipment and staff. Equipped with a “priority call” function, the current calls are blocked to give priority to an authorized person, for example for the transport of a victim of an accident, who needs to be transferred to the operating room.